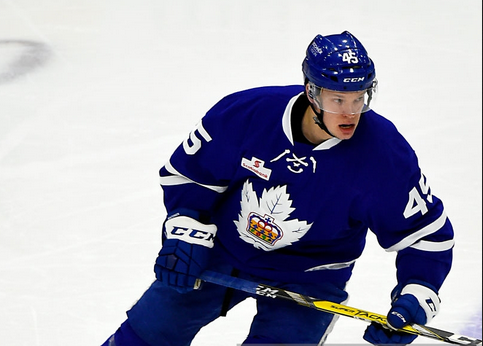 Miro Aaltonen scored at 10:59 of overtime to give the Marlies a 3-2 win over the Lehigh Valley Phantoms on Sunday, staking Toronto to a two games to none lead in the Eastern Conference Finals. Aaltonen’s goal finished off a tic-tac-toe rush as defenceman Calle Rosen – from just outside the left icing circle in the Phantoms’ zone – fed Andreas Johnsson with a cross-ice pass, Johnsson centring the puck to Aaltonen who netted his third goal in the past two games. Moments before the winning goal, Travis Dermott and Garret Sparks combined a pair of spectacular plays to preserve their team’s chance of victory. Dermott made a diving block on a pass to break up a Phantoms 2-on-1, then Sparks robbed former Marlies teammate T.J. Brennan with a scintillating glove save on a one-timer. Sparks made 35 saves in the win, none more timely than the stop on Brennan. Twice in regulation, the Marlies were quick to respond to goals from their opponents. After Lehigh Valley’s Mark Friedman opened the scoring at 7:54 of the first period, Trevor Moore tipped a point shot from Rosen past goalie Alex Lyon, just one minute and 40 seconds later to tie the game. The second period was scoreless. In the third period, the Phantoms took the lead once again after the Marlies got caught puck-watching and Mikhail Vorobyev, capitalized, finding the inside of the net. It took just 23 seconds for Toronto to even the affair as Carl Grundstrom sped down the right side and blasted the puck into the top corner above Lyon’s glove, rounding out the regulation time scoring. Lehigh Valley thought they had won the game in overtime when the mesh on top of the Marlies’ net bulged following a shot towards the goal. But replays confirmed that the stick of Frederik Gauthier, and not the puck, was what made the twine move. The series moves to Lehigh Valley for the next three games beginning on Wednesday.